With my love of boxes maybe I was indeed a cat in a previous life. 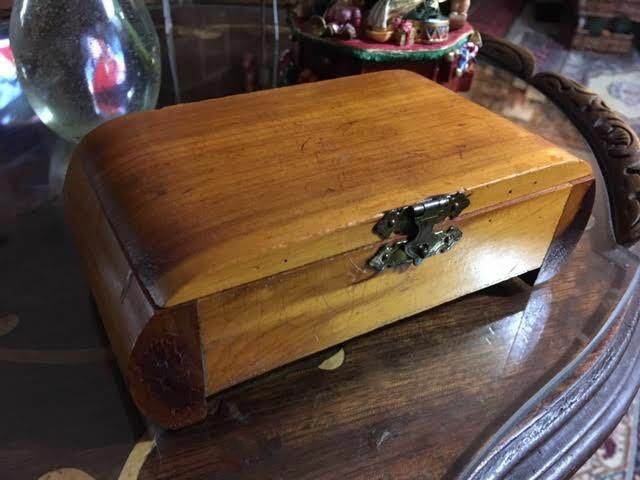 I ponder that thought sometimes because I find iI find it hard to pass them up, especially unusual ones like this scratched up 6x3x2-inch curved cedar box. No markings on it, nothing terribly special about it except for the interesting little shape. Oh, you don’t see any scratches? 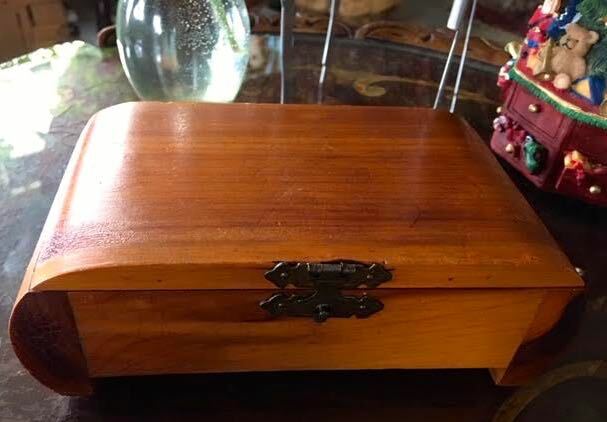 Here’s the box soon after I paid $1 at a local thrift store and unpacked it at home. The top was covered in a variety of scratches. None on the top were deep gauges but the scratches seemed bad enough that I considered sanding it down first. Definitely the gouge on the side was deep enough to suggest this might need first a good sanding but I decided to skip that step and see how it turned out. 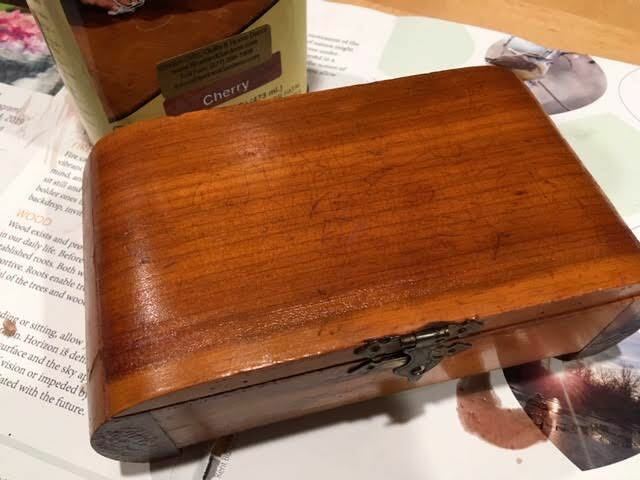 So I took the easy road and pulled out my Howard RestoraFinish in cherry and a bottle of Howard Feed N Wax, the two products we have packaged in our Howard RestoraFinish Furniture Refinishing Kit. To show you how simple this was to do, I dusted the scratched box just to remove any residue. Using a paper towel with Howard RestoraFinish in cherry, I covered the outside of the box and left it on paper to dry. 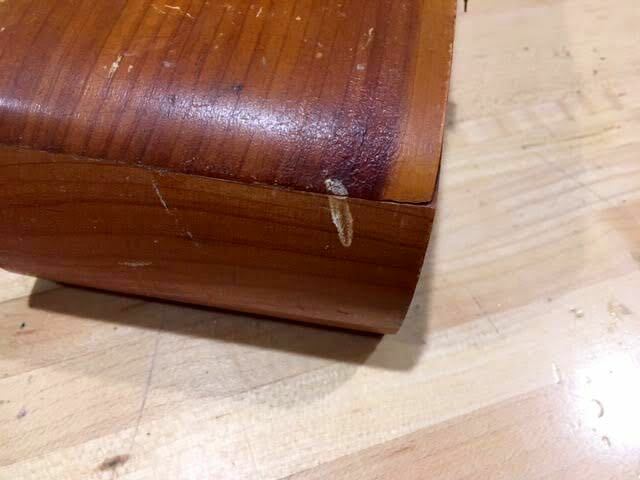 What about that deep gouge on the scratched cedar box side towards the front? Not a problem, that first layer of Howard RestoraFinish in cherry nicely covered it. 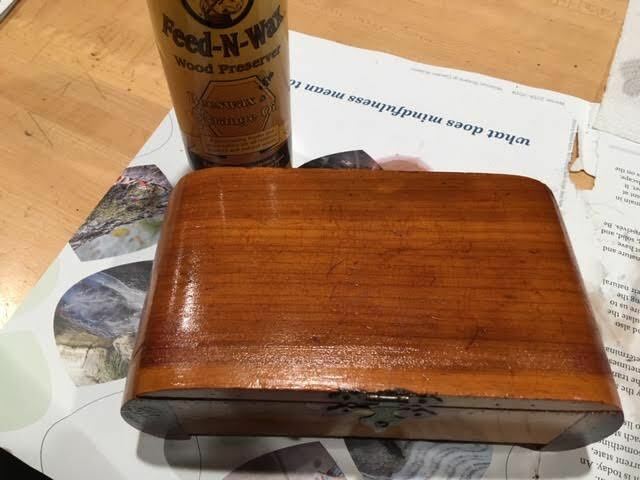 After waiting an hour, I gave the scratched cedar box my favorite Howard furniture refinishing product, Howard Feed N Wax. No need to use gloves here, the product not only rehydrates the wood but gives my hands a little beeswax and carnauba oil conditioning treatment. Another half hour wait and it was time to shine it up with an old cotton sock. The half hour wait allows Howard Feed N Wax to penetrate the wood and rehydrate wood cells, which brings out the beauty of the wood. I wouldn’t recommend polishing with a paper towel, the old sock is gentler and nicely brings out the wood luster. That was it. Honestly, that simple. No sanding. One coat of cherry Howard RestoraFinish followed by a dab of Howard Feed N Wax, both applied with a paper towel. The scratched cedar box now has a second life, replete with the side gouge that is barely visible. If I had treated the scratched cedar box and decided I needed to sand it, I could have done so but delighted I didn’t have to do it. Now I can’t think of any other products that are this easy to use and that produce such wonderful results. Can you?